I wonder how many of you have had the bittersweet experience of becoming the parent to one or both of your parents. Bitter because it is such a difficult thing - emotionally, physically, financially. Sweet because it usually means your parents have lived to a fine old age and you have been blessed to have them with you so long. 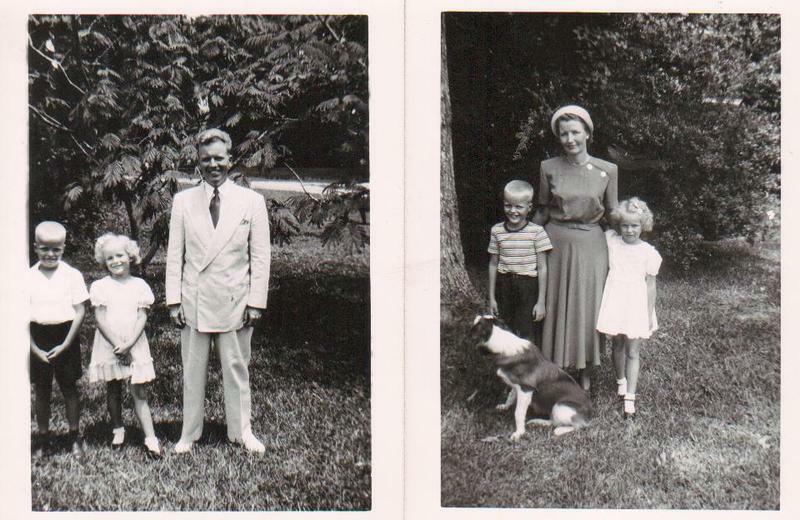 Did your family take those Sunday-after-church photos when everyone was dressed up and looking spiffy? Here are a couple of pictures of Randy and me with Mama and Daddy and our dog Sheba in 1948. These were taken in the front yard of our house at the end of Broadway. My father died in 1994 (in Houston) at the age of 86. He was needing a great deal of help by that time, but together Mama and Daddy were able to manage to take care of themselves. After Daddy passed away, we moved Mother to Waco and enjoyed having her live in very close proximity to us for another 6 years. She lived to be 91. Mother was severely crippled with rheumatoid arthritis so that she was wheelchair bound, and during her last 5 years she required a caregiver 24 hours a day. We were blessed to have two wonderful women who shared that duty and lived with her (alternately) in her own home. Randy and Jeanine moved to Waco during that time and we all lived within a square block of each other. What a blessed time!!! This photo was taken in January of 2000 at Randy's 60th birthday party. Mother was in such great spirits that night and I am so glad we have this photo. She got sick soon after this, was in and out of the hospital for several months, and declined very quickly. She entered into hospice care in her own home in May and died within a few weeks. She was ready to "go home" (as she expressed it), but we were certainly not ready for her to leave us. Two rather humorous things stand out to me as representative of this phenomenon of parenting your parents. One is that I was always hunting for things for mother. She was so grief stricken when we were packing up her things to move her to Waco after Daddy's death that she did not participate much in decisions that we made. Once in Waco she began to wonder about various things. I would come home from work and she would have fixated on something and need me to find it right away. I soon learned that it was far easier to search than to try to reason and put her off. Most of the time I could find what she wanted, she would look at it curiously, and then set it aside, satisfied that it was there. The other thing that stands out in my memory is that she could never decide whether she liked the skin on or the skin off of her baked potato. However, she definitely knew she felt strongly about it. One time I would come and she would be scowling at her caregiver, fussing because she had taken the skin off. "Judy took the skin off my potato. She KNOWS I like my baked potato with the skin ON!" The very next day the situation might be reversed. "Why did you leave the skin on my potato? You KNOW I like my potato with the skin taken off." Bless her heart...and bless her dear caregivers for their infinite patience. I wonder how many of you have had similar experiences...or perhaps are having them now? Please tell us about your parents and what your experiences have been with them as they have gotten older. My father passed away in 1989 at the age of 71. He died of Alzheimer's disease. That was a traumatic experience for all of us, especially my mother. One humorous characteristic of Alzheimer's patients is that they are in a completely different world minute by minute. My wife and I traveled to Houston to see my father. We had been at their home at least a day. Dad came around the corner into the living room the next day and was so surprised to see my wife and I. He exclaimed, "How long have you been here!" 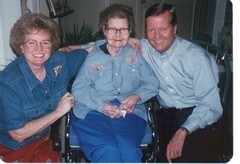 Last February of 2007, we moved my mother from Houston to Arlington into an independent living facility. She is 85 and needing some help. Although sometimes tiring, it is a privilege to care for her. After all, she devoted many, many years to caring for me. Charles, I remember your mom and dad from the early days of our childhood and how our parents were friends and instrumental in bringing us up in church and behavioral values. As you visit, please remind your mom of Harold and Amelia Neal. The role reversal illustrated by both you and Karla is so significant and most likely akin to many others in our class. The love you provide(d) to your parents might also be accompanied with stress notably with daughters and wives carrying the significant role. As I read Karla’s note, I was thankful and in a way envious at her having a parental relationship for that long even with the role reversal. My father passed away while I was in the 2nd grade at Park Place. From that day until now I have missed not having a fatherly or male role model and the deficiency was noticeable in my relationship with my children. My mother passed away two years after her retirement and her relocating from Houston to Oak Ridge, Tenn. I sometimes wonder if it would have been better for her to have stayed in Houston. We can’t go back but we certainly can thank our Father for bringing us up by parents that provided love, demonstrated the value of life and significance of death. I was blessed to have my father around until 1991 when he died at the age of 78. He was very sickly his last few years, from swallowing so much smoke and other junk as a City Fireman for 31 years. My step-mother was so devoted to him and catered to his every whim, no matter how minor the request. He spent so much time in and out of the hospital the last few years. No matter how bad his latest illness causing hospital confinement, his first lucid request after being admitted would be,"when can I get out of here and go home". I regret that he died in the hospital, on an early morning when no one was around. Fortunately,when I visited or phoned my father we always told each other I love you, hugged and gave each other a kiss. From my youngest memories, that was a ritual, when you came into his presence and whenever you were leaving. When I left him that last time, I leaned down and hugged him and kissed and told him I loved him. I know he died knowing how much he was loved. I just got an email from one of our alumni who told me she had to fly to Houston recently to see her aging and sick mother. I told her how lucky she is to have a surviving parent, that technically most of us are now orphans. I believe you should tell all of your loved ones you love them, every day, every time you talk. Life is too short and can be gone in an instant. As many of you know, my mother, was a graduate of Milby also. She took great pride in that fact. She toured Milby with us and enjoyed seeing many of you. After the loss of my husband, we became close friends. She was a delight.. A take charge go getter, always ready to go. She was a beautiful and elegant lady, always dressed to the nines. In October, 2005, right before her 82nd birthday she was diagnosed with Colon cancer. Her illness was devestating and ugly. I brought her to my home on Dec 1st under the care of Hospice and we lost her on New Years Eve. She lived a full life but even at 82, it was much too soon, leaving her children, grandchildren and great grandchildren, sister and so many friends who miss her terribly. My heart goes out to those who struggle with this event of life. I encourage you to cherish each day as though it's the last. When we learned of my son's death, her comment was, "when you wake up, you never know what the day will bring." Parents want to hear our voice and feel our touch. My last day of work was a Wed., back for my retirement party on Friday, and off to Louisiana to be with my mother, age 84. I call my mother every day and for months had heard, '' I haven't seen another human in a week, I am so tired of looking at these four walls, I am hanging on till you get here''. Well....I have spent over a month with my mother. Every time the sun was shining we went for a ride. The casino was one of her favorite places to go and we made several trips. It didn't hurt when I won $1440.00 my first night on the quarter machine and later $445 another night. At that point I felt like I had found a new profession, but at the end of my visit I knew it was not to be. During my visit I encouraged mother to drink water and eat..eat..eat. Loneliness does affect the appetite. We stocked up on different types of food that are easy to fix and a crock pot was purchased, along with a coffee pot with timer that goes off after a couple of hours. Mom wanted to make her funeral arrangements. We visited the local funeral home and picked out everything, down to the music. I was kind of taken back when her music selection was, ''Sentimental Journey''. The tombstone is to be in the shape of Texas because of her love of Texas, oh yes and a Texas flag flies in her yard. Mother made my son Keith promise to place a picket fence around her grave with a sign,''Don't Fence Me In''. All the insurance policies were collected and transfered over to the funeral home at the time of her death. All important papers were collected in one spot. at late or early hour. Yes, we had my mom's 100th birthday bash on 3/1/08 at Las Alamedas in Houston--It was such a beautiful room and she enjoyed it so much, ( although she actually thinks she is 102:)--My daughter, Schann, showed approximately 2 hours of slides of individual family members at various ages, and also many of my mom in the 20's etc.-- These slides were so much of a hit that I would recommend them for most family birthdays--What a great idea!! !--Even the young ones were absolutely mesmerized--We all will definitely remember my mom's 100th and feel so blessed to still have her with us--She is an absolute hoot --Thanks Karla for remembering.